“Fun, relaxing session! A good reminder that we all have spiritual needs and there are many ways to fulfill them. Thank you.” Participant, Real Estate Board of Vancouver, corporate team building “Lunch and Learn” session. NEXT Event – January 14, 2017. Registration and more info – click here. We invite people of all ages, abilities and mobility to try their hand at drumming at the only regular Community Drum Circle on the North Shore. Drums are provided, including tiny drums for tiny hands!! > “One World, Many Voices – A Multi-Faith Musical Celebration of Spring”, with Lyle Povah and Tatiana Speed – Devotional Chanting, Sunday April 22, 2012. By donation, with proceeds to “Musicians without Borders”. Note: “Drumming and Health” has lead workshops and retreats for the United Church in Toronto Ontario, Edmonton Alberta, Vernon and Victoria BC, as well as Canadian Memorial, Burnaby, Chown, Shaughnessy Heights, Crescent and Ryerson United in the Lower Mainland. 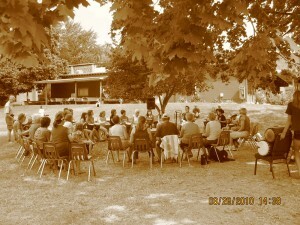 A Drum Circle can become a safe container within which to engage in authentic and meaningful discussion about spirituality and personal healing. For many others, it becomes a deeply spiritual experience, and words are unnecessary. The notion that our spiritual nature can be accessed and expressed through the drum is an age-old tradition. There are many rhythms, songs and chants that celebrate spirituality and healing… all are intended to build rapport and set the mood for inquiry and connection. 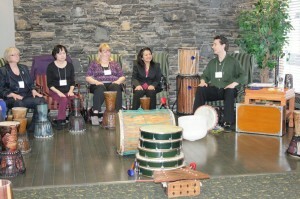 > “AFRICAN DRUMMING – BRIDGING SPIRITUALITY AND THE HUMAN EXPERIENCE”, at the 2010 Canadian Association for Pastoral Practice and Education(CAPPE) National Conference in Banff Alberta, Canada. 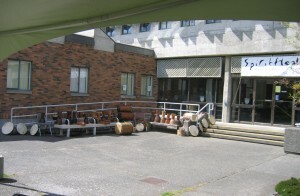 > “AFRICAN DRUMMING AND SPIRITUALITY: THE EMERGENCE OF SPIRIT IN THE DAILY RHYTHMS OF LIFE”, co-lead with Colleen Steel at the ‘Spirit Heals’ Integrative Medicine Conference at the University of Victoria in Victoria B.C., Canada. A HEALTH CARE PERSPECTIVE: We often say “Mind, Body and Spirit” when referencing an integrated human being. The Western health care culture is much more definitive when describing and addressing mind and body, yet less so with spirit. 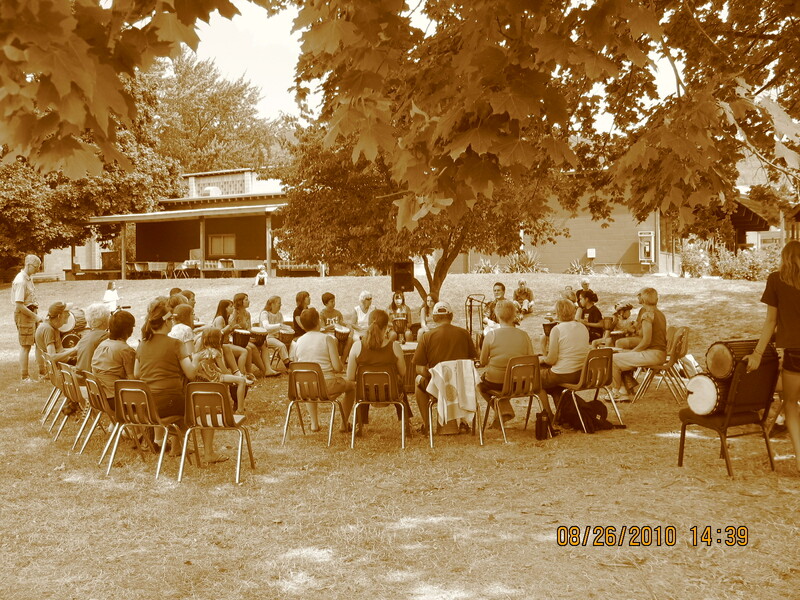 A Drum Circle is an expressive and cooperative process that can evoke in participants some of the elements of spirituality, such as contribution, connection, creativity and surrender. Individually and as a group, we can experience how making sound can quiet the mind, soothe the body, and create community through connection to oneself and others. This further highlights our interconnectedness and can open up a pathway to Spirit. > PRESENTED AT ‘LEAD 2004 – FAITH FORMATION THROUGH THE LENS OF THE ARTS’ – United Church conference in Banff Alberta, Canada. A MusicWorks article “Drumming and Spirituality” was written as supplementary workshop material – SEE EXCERPT BELOW. Complete article available on Research and Articles page.